Starring in what is quite possibly the most moving double performance ever recorded on film (Time), Anne Bancroft and Patty Duke are remarkable in their Oscar-winning portrayals of Annie and Helen. Ennobling and uplifting (Variety), this inspirational story of courageand hope is one of the finest works of art in the history of motion pictures (Boxoffice). Locked in a frightening, lonely world of silence and darkness since infancy, 7-year-old Helen Keller has never seen the sky, heard her mother's voice or expressed her innermost feelings. Then, Annie Sullivan, a 20-year-old teacher from Boston, arrives. Having just recently regained her own sight, the no-nonsense Annie reaches out to Helen through the power of touch, the only tool they have in common, and leads her bold pupil on a miraculous journey from fear and isolation to happiness and light. For more books for all ages about Helen Keller, visit A Mighty Girl's Helen Keller Collection. 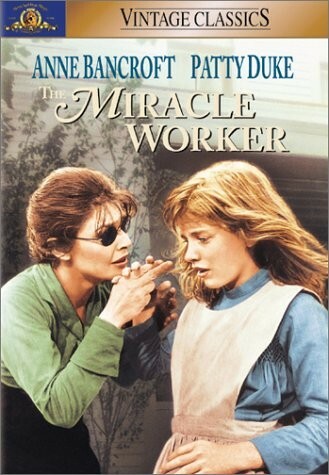 Patty Duke and Anne Bancroft had been playing their respective roles as Helen Keller and her teacher, Annie Sullivan, on Broadway for some time before director Arthur Penn (The Left-Handed Gun) built a mesmerizingly beautiful film around their layers-deep performances. Duke is astonishing as the deaf, blind, mute Keller, who awakens to an awareness of language under Sullivan's determined guidance. Bancroft is fascinating and focused.